I can count off the top of my head about 6 thrift stores near me and we go to all of them at least once a month. Sounds shocking but it’s not especially when we are looking for something we need. Most often it’s clothes, craft supplies, CD’s and kitchen items. On occasion we find furniture or home decor but we really don’t need any of that stuff any longer. Shopping online sites like Kijiji or Craigslist is just as naughty as shopping secondhand because most often items purchased are well-loved or deeply discounted by the owner. Thrift shopping online can be far more dangerous than going into the shop because you can do it from the comfort of your home. Sarah a mom of 2 young boys emailed me looking for some advice to help her curb her obsession with thrift shopping. 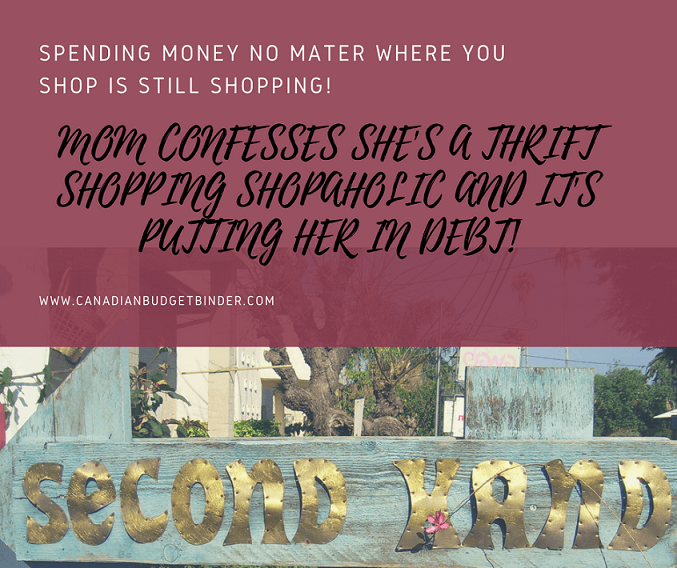 She’s not alone in her plight to cut costs yet over-spend buying used and in some cases brand new items with or without tags. My name is Sarah and I live in Hamilton, Ontario with my husband and two boys aged 10 and 5. Before we married my husband and I were both thrifty because we weren’t fans of debt. Graduating from University meant that we had some school debt but not like some of the graduating students today. The reason for that is because we worked hard in the summer to help pay for our education as our parents weren’t in any position to do so. Moving forward we got married, bought our first house and started a family. In just under 10 years we managed to pay off our mortgage so we are completely debt free. We do have a monthly budget that we do our best to stick to but the past year we noticed that I’ve spent far too much time thrift shopping. Our thrift shopping budget category offers me $50 a month but I’ve been easily spending over $200.That’s a whopping estimated expense of $1400 a year. I know, don’t scrutinize me because I know I have a problem and that’s why I’m looking for help. That $200 could easily go towards our RRSP or TFSA but instead I’m blowing it on stuff I can mostly do without. I never thought the day would come where I would admit to having a thrift shopping addiction but I do. I find it difficult to shop at the mall for new stuff so I look for the best deals I can find at thrift stores. I could only imagine if I had a mall obsession but thankfully with my frugal mindset I don’t often go to the mall. Even though I sound like I’m smart with my money and have frugal on the brain I’m not as smart as you may think. At least once a week I make an effort to go thrift shopping after work so I can wind down before I get home. Some people go for drinks and I like to see if I can find any bargains. To make a long story short I need to stop doing this but it’s become a dependency for me since I work in a stressful position and need to decompress after my shift is done. I tried going for coffee but that just kept me wired when I wanted to chill out. One day I made a stop at Value Village and now they know me by name. Sad isn’t it? Well, I want to kick this obsession I have with thrift shopping because I’m spending too much money and it’s coming from our savings account. I know my husband doesn’t worry since we are debt free but we still have to build our retirement savings. I’m just not sure what I can do to keep me from wanting to go thrift shopping after work. I was hoping some of your readers or yourself would have some advice for me. This is a tough one because Sarah has now created a pattern of happiness to decompress after work spending money thrift shopping. You might be someone who heads to the gym after work to burn off energy and chill before you head home to the family. I know a guy who likes to smoke a marijuana joint after work because it helps him calm down and not take out his frustrations of the day on his family. Everyone reacts differently to stress and how we handle it dictates whether we are getting the stress under control or causing further stress but in another category. I believe this is what Susan is doing because she seems to be looking for an outlet to let loose and forget about her work day. It wouldn’t surprise me if she goes thrift shopping on the not-so-good days on the job as opposed to great days. One of the driving factors of over-spending on stuff we don’t need is motivation. We motivate ourselves to do what we do even if we know it’s not the best option for us. Congratulations Susan reaching out for help and for noticing that you were throwing your budget off-balance with your shopaholic tendencies. One of the smartest things you can do right now Sarah is get out of the thrift shopping mindset so you can put the money you are spending towards something that adds value to your life. I have a few suggestions for you and I hope that you find the peace and path you need to lead you home and away from the shops. 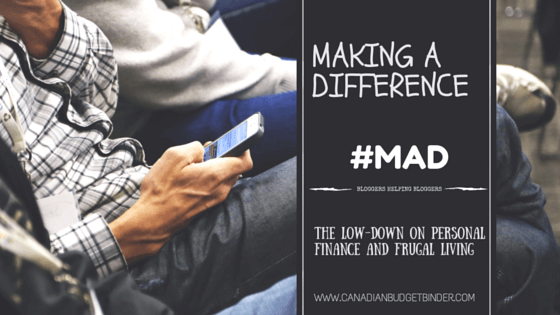 Keep using a budget! If you aren’t happy with your current budget option certainly download a copy of our Free Budget Spreadsheet to see if it helps makes budgeting more accommodating for you. Change your mindset– Somehow you’ve managed to convince yourself that thrift shopping is a great way to get that high before you go home after work. Unfortunately that adrenaline rush you get comes with a heft price-tag. Grab a piece of paper and write down all the reasons you must stop going thrift shopping after work. Also add in how you typically feel when you go shopping and what it does for you. This way you are better suited to find alternate options that aren’t costing you money but giving you that happiness high you crave. Change your route– If you purposely drive past the thrift stores, stop doing this. Find an alternate route to get you back home or to that happy place that we talk about in #1. You may end up at the park to read a book, listen to music or working out at the gym. If you love to cook sign up for a course after work that gets you pumped and ready to own the kitchen when you get home. The possibilities are endless but you have to convince yourself first that you want to try them. Change your money access– If you take your wallet to work leave it at home if you don’t need it. You could also just leave your wallet at home and give yourself a cash allowance which I do and that’s all the money you get. When you don’t have plastic or paper around then there’s no way you can spend it. Sarah, I hope you are successful on this journey to crush thrift shopping so keep us up to date and let us know how it’s going. The lesson we learned here today from Sarah is that just because you are debt free that doesn’t give you free rein on your money. You must still budget and plan for today and the future which means saving money and spending less than you earn. Mortgage freedom means you still have to run. Since Mrs. CBB and I paid our mortgage off in full a few years back we’ve noticed that we’ve become a bit relaxed in the savings department too so it’s easy to fall off the finance wagon and tougher to get back on. Don’t give up hope. Please read the comments as the fans may have more to add and suggestions for you. Discussion Question: What other ways would you suggest to Sarah to help her stay away from thrift shopping after work? This was another week of racing to work in the morning and spending time getting my office sorted and updating files and documents. So far things are going great but I’ve already been doing the job for the past few years which made the transition from part-time to full-time easier. Summer has come to an end I didn’t get near enough done from my to-do list as I thought I would. I guess I over-book my expectations of time but this summer it was about my family. I’ve spent so much time away from them the past few years and I can never make that up to them. Even though all of my time was working I know that if I hadn’t done that I likely wouldn’t be where I am today. The next few weeks I will be working on the yard once again although I’m hoping to wrap up the A/C for another year this weekend. I’m the guy who says he’s going to do something then the next day something else pops up. Sound familiar? It happens to the best of us but what can you do. Mrs. CBB and I have experimented the past 2 weeks with microwave biscuits and we think we’ve nailed our favourite so far. One of the experiments turned the biscuit into a double layer cake with buttercream frosting, low carb and sugar-free but not what we hoped it to be. It was great though. Our next experiment will be making a cheddar cheese and chives scone with the rest of the garden chives and possibly a tomato, chives and cheese. Sounds good but whether it works or not is another story. That’s all…thanks for keeping up with the CBB family. This week I ran into a blog post title that caught my attention as I’m sure it did many others, “Stealing from Babies“. It certainly was not what I expected BUT a very good lesson for those of you who send money in the post. Gone are the days where slipping cash into a birthday card because of theft. Theft at the processing and delivery level have been going on for years and it makes it tough to stop unless someone is caught red-handed. Another theft that has been on the rise is post-box theft. For those of you who accidentally leave your post box left unlocked or those who get home delivery. There are people who go door to door and snoop in mailboxes in hopes of finding gift cards or other envelopes that resemble a card of sorts that might have cash in it. The moral of this blog post is not to send money in the mail and to be aware of the reasons why and what your options are instead. No stealing of babies involved here just a personal story from a blogger who wanted to let you know how it all went down in his world with theft and the post. If you are a personal finance blogger and would like your blog to be featured simply drop me an email. I’m currently booking October 2017-Limited spots. Don’t be shy get in contact with me today! I’m Tom Drake, the blogger behind MapleMoney, which for more than eight years was known as Canadian Finance Blog. I wasn’t always into personal finance, but that changed fast. Starting back in the fall of 2008, a six-month span saw me get married, my wife was pregnant, and we were looking to sell our town house and buy a house. All these major life events made me start taking my money more seriously. I started reading MoneySense magazine and blogs like Million Dollar Journey (and others that are no longer active). Then I got a library card and devoured every book I could relating to saving money or investing. By early 2009, I thought I had compiled my own unique perspective on money, between all the information out there, the life experiences I was going through, and my day job as a Financial Analyst. 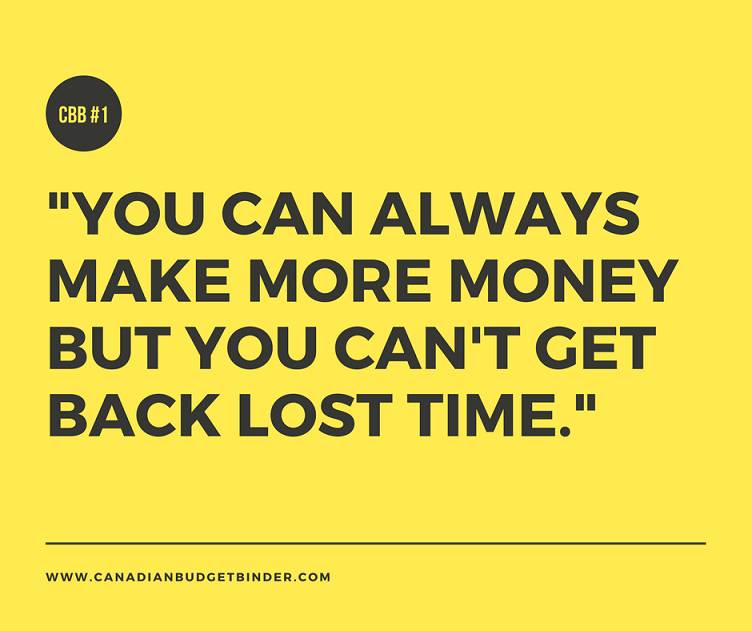 With all that, I decided to start Canadian Finance Blog, which over time won multiple awards and became one of the biggest personal finance blogs in Canada, thanks to the readers. Fast forward to 2017. I have two children in elementary school (the youngest goes into kindergarten this week!) and the site is now known as MapleMoney, where I look to help Canadian families make more money, save money, invest their money, and spend money wisely. If you’d like to create lasting financial freedom in your life, I’d love to have you come join the journey at MapleMoney! Read how my week went above and you’ll understand where this quote came from. It’s important to prioritize your life but remember that things change and your family needs a piece of your heart as well. You can’t get that time back. 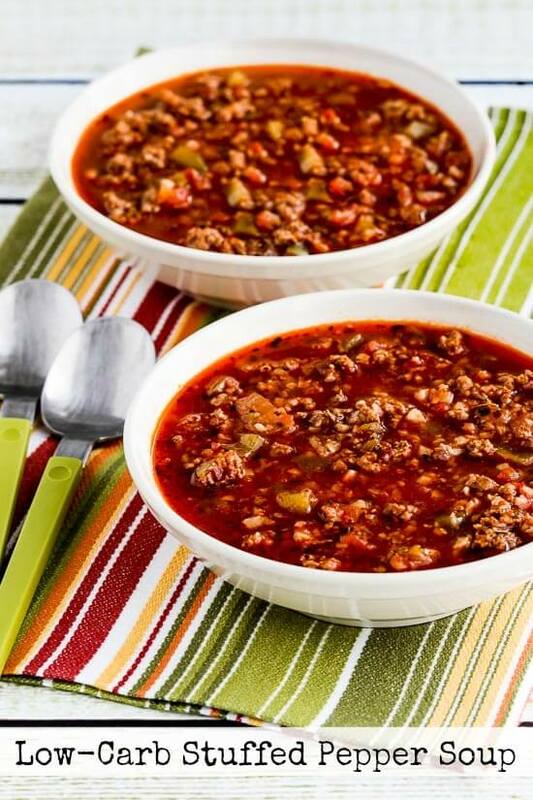 I dove into Kalyn’s Kitchen to check out this Low Carb Stuffed Pepper Soup because soup season is officially here and we’re on the hunt for delicious soup recipe inspirations. What we love about this recipe is that it is versatile so you can switch up the meat and use beef, turkey, chicken or other types of sausages. With the amount of tomatoes, yellow zucchini and green peppers we brought home last week from the in-laws I see a tomato, beef, pepper and zucchini based soup on the horizon at the CBB house. I love free stuff especially when it involves arts and crafts for kids but this one is a bit different because it’s for adults who want to add seasonal touch to their home. These 4 FREE Fall Decor printables can be popped into a frame and hung on a wall or sat on a side-table or hallway-table. Enjoy your free printables and say thanks to Landeelu! Printable fall decor is the easiest way to get your home all cozied up for the crisp fall weather. You simply need to download, print and pop the image into a picture frame you already have on hand! What could be easier? I love to decorate for the holidays but if I can get instant and beautiful results I totally jump at the chance! What happens when Walmart forgets to charge you for a product?– Lucky for you and SOL for them unless of course you are honest and bring it back to pay for it. Clearing 100K worth of debt– Almost sounds as easy as using a chalkboard eraser. I’m in debt for $60,000 but have no job and I’m homeless– Well, sounds like you’ve got some work to do. See if there is any community support or government support that can help get you on your feet. Call all of your creditors and let them know what your situation is. Peaches and Cream Yam– Now there’s something I’m going to Google.